I feel the picture/sound reviews are very accurate. The reference systems are awesome. The WSR staff is knowledgeable and friendly. The on-line version of the magazine is a great reference tool. 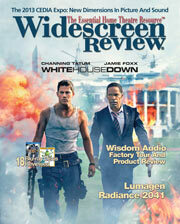 It is the most technically advanced home theatre magazine out there. If you consider yourself a serious home theatre buff, you should subscribe! It doesn't get anymore cutting edge than your Reference Holosonic Home Theatre Laboratory. Gary Reber has the coolest job on the planet!